With each new upgrade, the iPhone gives you more tools to communicate. With iOS 10, you can use what Apple calls the Digital Touch feature. 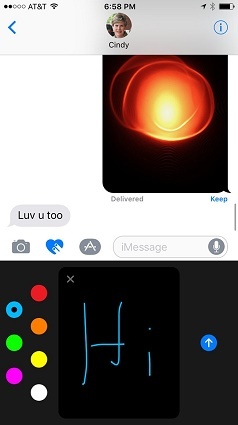 Special effects in Messages can range from sending your heartbeat to sketching a quick picture to sending a kiss. To send a Digital Touch in a message, open a conversation and tap the Digital Touch button. If you only see an arrow where the Digital Touch button should be, tap the arrow to reveal it. 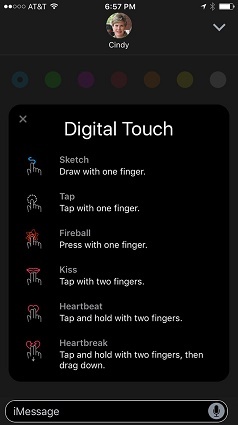 In the Digital Touch window, touch, hold, and release the gesture icons on the right side; you’ll see a list of the gestures and what they do. Perform a gesture in the Digital Touch window and it will go to your recipient. Your recipient will receive the extra “touch” you’ve added to your message.